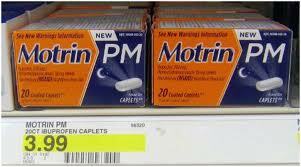 Motrin PM is one of the best combinations of a pain reliever and a sleep aid. I have found that it works well for fever, too, and much better than Tylenol, for example, on most everything. Plus, the sleep aid is very gentle. The caplet itself is very smooth and easy to swallow. 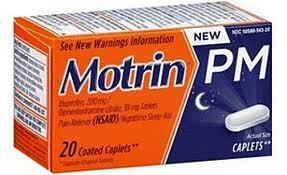 I will note, however, that it may take one or two uses of Motrin PM for one's body to get used to it. That is true with EVERY sleep aid. I suggest taking just one pill at first and allowing a full night's resting time before trying to take the recommended dosage of two pills on a subsequent night. Remember, too, that this is ibuprofen. So, if you are sensitive to it (stomach upset), you may want to consider something else. Works excellent for me. Price: $3.99 to $4.99 depend the store . Leave your comments. Thank you.